A companion to St. Francis and inspired by his leadership in the early 13th century, St. Clare founded a religious monastic order that ultimately gained 10,000 followers committed to serving the poor and sick. Despite papal pressure, Clare insisted that the principles laid down by Francis needed to be followed and, ultimately, Pope Innocent IV agreed to her stipulations. Born in Italy during the early 12th century, Clare lived a quiet life in the sleepy town of Assisi, Italy. She would eventually grow to become a nun and follower of St. Francis. Discovering a inner peace that could not be reproduced any other way, she converted to being a Franciscan and devoted the rest of her life helping others around her. As a child Clare payed and studied her Bible as many of her time did. Even from an early age, Clare knew she was destined for something bigger. After a disagreement with her parents about whom she should marry, she ran off from home to hear St. Francis give a Mass on Lent. Her life would soon change dramatically. St. Francis himself stated that she was chosen by God to lead others. He took her in as a student and showed her the ways of living like a nun. How does a Nun live? You might ask yourself; who is a nun? or how do they live? A nun is a woman (usually of Catholic faith but there are some different Christian nuns and also of other faiths) who devotes her entire life to serving god through chastity (not getting married and being pure), poverty and obedience. Clare was like many other nuns. Her life surrounded around the church and volunteering her life to help others. Inspired by St. Francis’s words St. Clare led a life of Chasity (that means she never married), volunteer work and reading her bible daily with the ladies that followed her (think book club to the extreme). 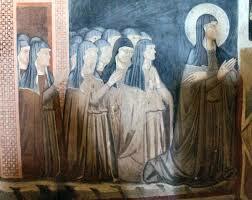 The order of Poor Clares was, and still is, a small band of woman who followed St Clare as she followed St. Francis. Devoted to the simple life of manual labor and prayer the poor ladies relied on donations by those that St. Francis and St. Clare would preach to for food and other essentials. Think of them as a group of friends who had a massage they wanted to get out. The best way back than wasn’t through making a blog or Facebook page, but by going to the different villages, and speaking with the locals. They were so good at it that they never needed to buy anything! Now that’s a sales pitch. St. Clare soon help establish the “Order of Poor Clares,” a home for nuns in Assisi Italy to live together in a dormitory like community and further learn and live the teachings of St. Francis. St. Clare is one of the few saints that were popular during the Renaissance as well as other periods of art. many painters found her an interesting Saint to portray. she is often seen with a crosier, or staff with a hook at the top. This item was usually reserved for men since it represented power and leadership. 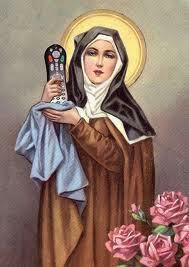 St. Clare had both of those during her lifetime, so naturally she was painted with this item. Other painters will show her holding a lily, symbolizing her peace and purity as she is married to Christ. The halo painted in gold around her head (also seen in the above picture) is to represent her canonization and that she was someone very close to God. 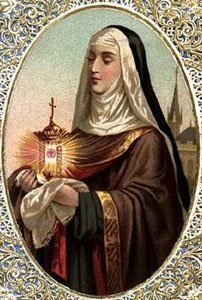 Rumor has it that when an army approached Assisi St. Clare stood before them, dropped to her knees and began to pray while holding a blessed sacrament. Moved by her courage and her nobility to stand before thousands of armed men, the attackers left Assisi and her alone. 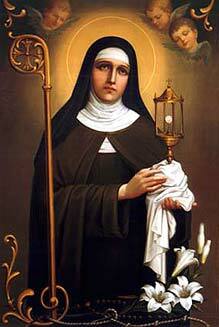 That’s right, St. Clare of Assisi, the patron saint of TELEVISION! Pope Pius XI (11th) deemed her the patron saint of Television after multiple reports from Clare that she was able to see and hear Mass in her room since she was too sick to attend the church. Debby, Nirit Ben-Aryeh. “St. Clare Of Assisi: Charity And Miracles In Early Modern Italy.” Franciscan Studies 71. (2013): 237-262. Academic Search Complete. Web. 17 Feb 2014. Fortini, Gemma, and Finbarr Conroy. “The noble family of St. Clare of Assisi.” Franciscan studies 42.1 (1982): 48-67. Power, Edna. “The Novice.” Medieval English Nunniers . Cambrige : University of Cambrige Press, 1922. . Print. “Saint Clare of Assisi“. Saints.SQPN.com. 13 August 2013. Web. 17 April 2014. 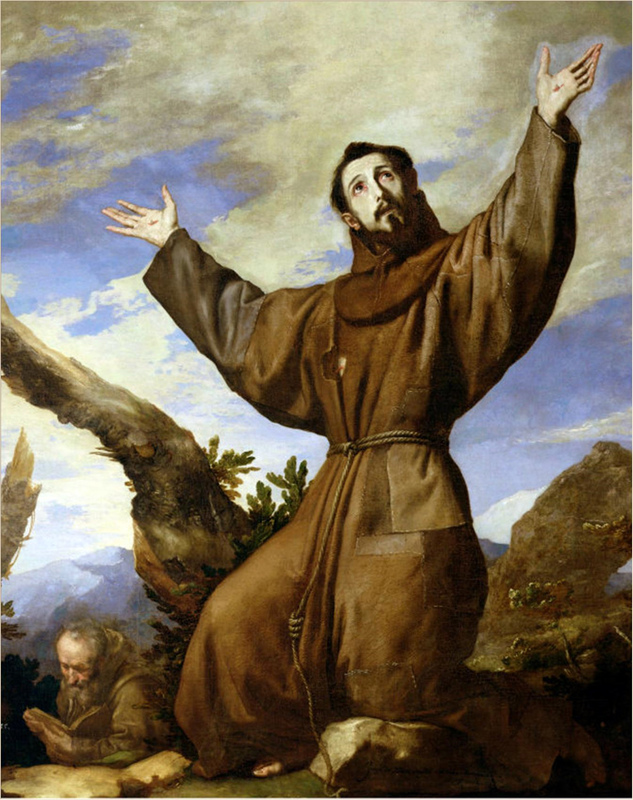 An Italian born friar and preacher, St. Francis devoted his life to spreading the gospel of not only the Catholic faith, but of the beauty of nature. His teachings were heard and followed by many, including St. Clare who first heard him speak at the age of 18. St. Francis’s strong voice reached thousands from Italy to Egypt. Francis preached discipline, among other things, and those that followed him did so closely. Those who chose to follow Francis around while he preached across Italy were known as the Order of Friars Minor. They were a close knit group of dudes who supported Francis wherever he went and did charity work wherever they ended up. 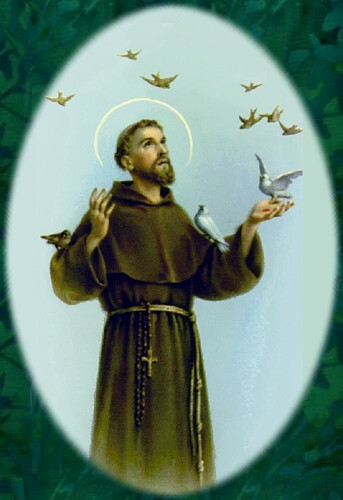 Francis’s support for both nature and animals is what led him to become the patron saint of both. He cared about them so much in fact, that legend has it he stopped on his way to a village to preach to a gathering of birds in the trees. Surely, this can’t be true; can it?